Review posted May 6, 2016. Here’s a debut fantasy novel about finding one’s identity and place in the world. This is wonderful fantasy, but not your traditional medieval European world – this one involves Djinns, Ghouls, Skinwalkers, Nightmares, and other desert beings. We’ve got an oppressive regime and unjust society, and we start by focusing on someone caught in that injustice. Amani is an orphan living with her uncle in a world where girls have no rights. Everything she has belongs to her uncle – and will belong to her husband after he marries her off. That event is looking harder and harder to avoid, and Amani is desperate to escape. When the book opens, Amani is risking all the money she has managed to scrape together over the past three years to enter a shooting contest in Deadshot. If she can win the prize, she’ll be able to buy train passage to the capital city. Amani has the shooting ability to win – but not the ability to overcome the way the contest is rigged. But during the contest she meets a mysterious foreigner who is also a skilled shooter, and she becomes part of a brawl that sets the whole place on fire. So the next day, she’s back home in Dustwalk, tending her uncle’s shop, hoping no one recognizes her as the blue-eyed boy at the shoot-out. And who should run into her shop but the foreigner from the night before? And he’s followed by a group of soldiers, but Amani lets him hide behind the counter and covers for him. After all, he saved her life the night before. Then when it turns out he’s been shot, she returns the favor. But while she’s tending his wounds, she hears the bells that mean a Buraqi has been sighted – a desert horse, made of desert sands. When the horse is captured and forced to stay materialized with iron shoes, the Buraqi provides a way out of Dustwalk for Amani – and the foreigner along with her. But that’s only the beginning of the saga. She continues in an adventure across the desert. The soldiers are looking for her because she’s been seen with the foreigner. And it turns out, he’s involved with the Rebel Prince, who some say is the rightful ruler of Miraji and wouldn’t give their country over to the Gallans. 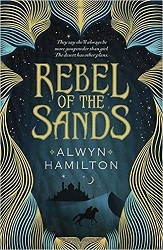 Along the way, Amani meets others in the rebellion and learns startling things about who she is and where she belongs. This is a very satisfying fantasy adventure novel. It ends at a good place, finishing one segment of the story, with no cliffhangers (which is how I like it), but still leaves you hoping to hear more about these people and this world. It’s a debut novel, and is a wonderfully propitious start. I hope there will be many more books about Amani and Jin and desert magic and the struggle for the Rebel Prince.